The operator of McDonald's in Japan and Cargill Inc have denied responsibility for a strip of plastic recently found in a chicken nugget. What's actually in McDonalds' chicken McNuggets? The operator of McDonald's in Japan and Cargill Inc have not discovered any link between a Cargill-owned plant in Thailand and a strip of plastic found in a chicken nugget this month that sparked uproar over product safety at the fast-food chain. McDonald's Holdings Co (Japan) Ltd and Cargill said in separate statements that an investigation showed the type of plastic found in the McNugget on 3 January 2015 by a customer in Misawa, northern Japan, was not used at the plant in Saraburi, Thailand where the food was produced. "We are very confident that the plastic film in the nugget occurred outside of our production plant," Chuck Warta, president of Cargill Meats Thailand, said in the statement. Read: Is it really safe to eat McDonald's again? 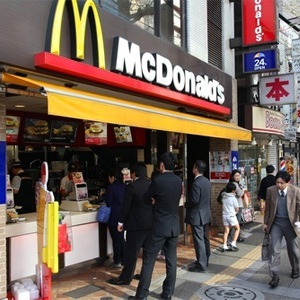 McDonald's Japan said the Misawa store did not use that type of material either, and that the possibility of the plastic entering the nugget during food preparation at the store was low. It was thus unable to determine the origin of the plastic. News of the find was followed by other complaints of objects discovered in McDonald's Japan food, including a human tooth in a French fry, drawing an apology from the company last week. Image: McDonald's Japan executives Takehiko Aoki (R) and Hidehito Hishinuma bow their heads at a press conference in Tokyo on January 7, 2015. A human tooth was served with French fries at a McDonald's in Japan last year. YOSHIKAZU TSUNO/AFP/Getty Images. The plastic incident was the latest trouble for a fast-food chain hit by sliding sales. On Friday, McDonald's Japan said same store sales fell 21 percent in December from a year earlier, the 11th straight month of decline, after suffering a shortage of French fries.